Findings: The component parts and materials used to complete a piece of jewelry. 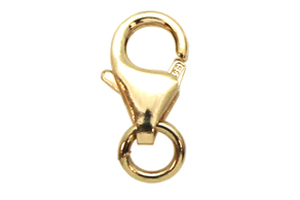 Bail: Components used to easily attach pendants or charms to a chain without the soldering being required. Bead: A small, often rounded piece, with a hole through it so it can be strung. Beads can be made from a variety of materials. 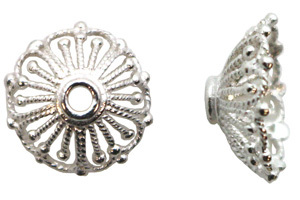 Bead Cap: A metal ornament, which is used to highlight beads and turn them into a focal piece. They are also used to cover up any imperfections or damage around the drilled hole of the bead. Bezel: A metal ring that holds a stone in its setting. 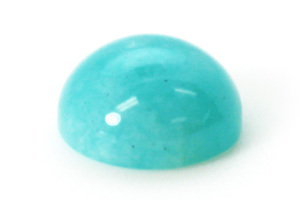 Cabochon: A highly polished gemstone used in bezel settings. They have a curved top and flat bottom to allow them to sit in the settings. Clasp: A device that allows the two ends of a chain to close together. They can be functional and decorative, coming in many styles and shapes. 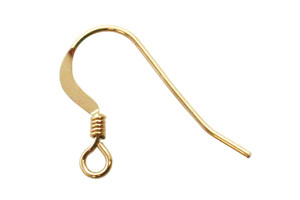 -Lobster Claw Clasp: With the look of a lobster claw, it has a rounded top with a self-closing bottom hinge that opens when a small lever is pushed. 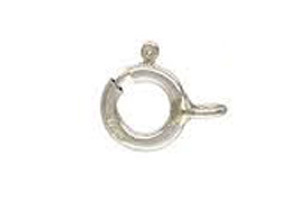 -Spring Ring Clasp: A round hollow ring with an inner wire that is opened and closed by pulling and releasing a lever on its side. 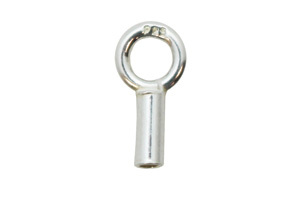 -Magnetic Clasp: Attracting magnets on each end are used to close securely and open easily. -Toggle Clasp: Has a bar that is pulled through a ring and cannot pass through again, making it secure. 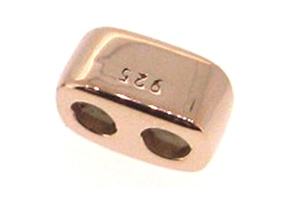 Crimp Bead: A small round or tubular hollow bead that is secured to jewelry by flattening it with pliers. Often times they are used to secure clasps or floating beads on stringing material. Earwire: A curved and looped piece of wire that is one part of an earring. 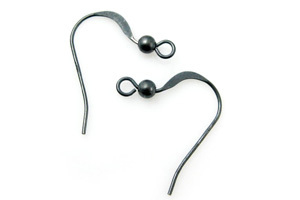 The curved part fits through the piercing of an ear and a loop is used to dangle a decorative finding. 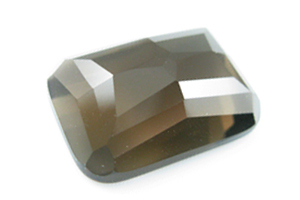 Faceted Stone: A polished gemstone with many flat cut surfaces called facets. 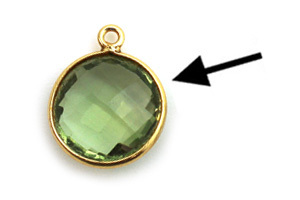 This helps the gem reflect light, making it look brighter and shimmer. Gauge: The thickness measurement of wire or metal. The higher the number is, the smaller the size. Gold Filled: Legally required to contain 1/20 gold by weight and more valuable than gold plated. 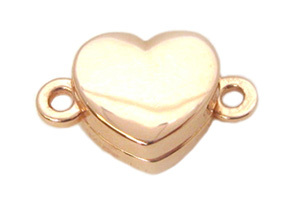 It will not tarnish or fade over time like gold plated due to a different bonding process. Gold Plated: Covering another type of metal with a thin layer of gold using electroplating. 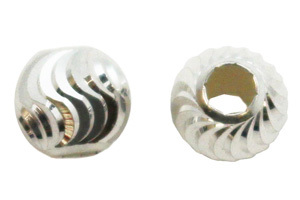 Half-drilled Bead: A bead that only has a hole halfway through it and can be glued onto metal pegs to create charms, pendants or stud earrings. 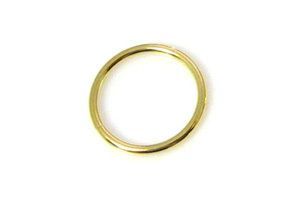 Jump Rings: Small, round connectors used in jewelry making. 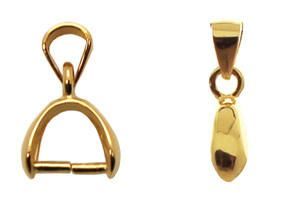 -Open Jump Rings: Have a divide in the wire that can be pried open and closed using pliers. -Closed Jump Rings: Cannot be opened as they are soldered shut. They are ideal for projects that require a stronger connector for heavy or expensive pieces. Oxidization: A reaction that occurs when sterling silver is exposed to oxygen, sulfur, and moisture in the air over time that results in a dark tarnish on its surface. 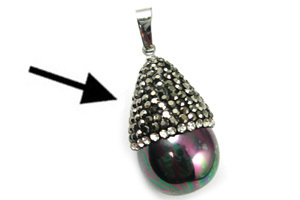 Some jewelers purposely give a black patina to sterling silver by using chemicals to speed the process up. Pave: Tiny gemstones set close to one another with no visible metal that results in a “paved” stone surface look. 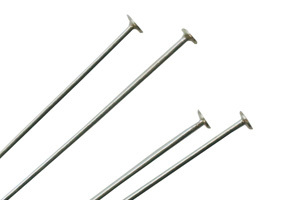 Pins: Straight pieces of wire, which can come in many gauges and lengths. 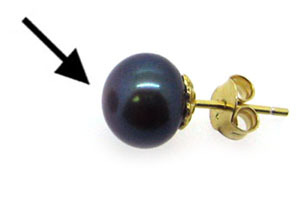 -Ball Pins: Have a small ball at the end to prevent beads from sliding off. Loops can be created with pliers to attach to other findings. 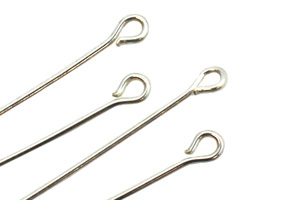 -Eye Pins: Have a small loop at the end. 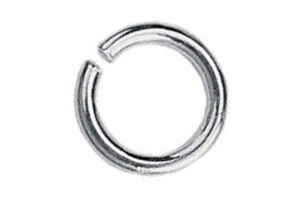 The loop can be attached to other findings to make longer pieces. 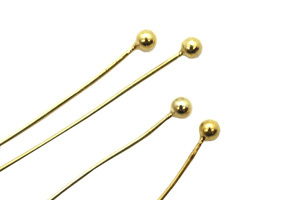 -Head Pins: Have a flat or round end that keeps beads from sliding off. Loops can be created with pliers to attach to other findings. 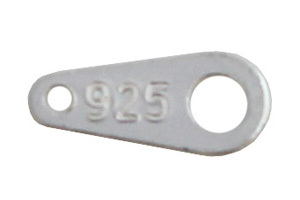 Quality Tag: A small, flat piece of metal that has the metal quality stamp or trademark of the manufacturer or artisan. 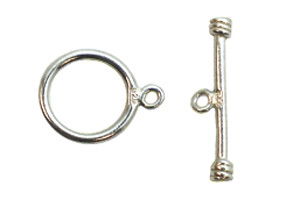 They usually have a hole on each end to easily attach to the chain with jump rings. Rhodium Plating: Done like gold plating with electroplating, rhodium plating is used to prevent scratching or tarnishing on sterling silver. Rhodium is a precious metal of the platinum family and is also a good option for those with nickel allergies as it is hypoallergenic. Rose Gold: Done like gold plating with electroplating, rose gold is a combination of specific amounts of silver, copper, and gold. 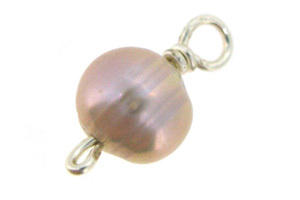 Slider Bead: A bead with an inner silicone layer that allows the bead to grip chain or cord. The silicone allows the bead to stay in place while also making it easy to adjust its position if needed. Sterling Silver: An alloy of silver with a silver content of 92.5%silver. The remaining 7.5% is of other metals. Wire wrapping: Using wire around a bead, stone, other findings, or itself, to create pendants, charms, or decorative patterns for jewelry pieces. Vermeil: Vermeil is a combination of sterling silver and gold, usually a sterling silver core with thicker gold plating of 2.5 micron thickness.